Beautiful location, facilities and staff were fantastic. If you don’t have a lot of time to pick a dreamy seaside destination, the easy—and easygoing—choice is Hawaii. Made up of eight main islands, this American oasis is home to photo op-ready beaches, a fun-loving Polynesian heritage and nightlife that’s bookended by unbeatable sunsets and sunrises. Dig into delicious island cuisine or go bottoms up with the regional favourite cocktails, mai tais. Then sleep off that food coma (or hangover) under the Hawaiian sun on a white, black or even green sand beach. Fill your itinerary with historic tours, beautiful views and island events in the only state where every visitor gets “lei-ed” at least once. With almost 400 beaches in Hawaii, you could fill several holidays sprawled face-down on a towel. For an even bake, don’t forget to flip over. If you want to save time for a trip to the USS Arizona Memorial in Honolulu or a hike out to the peaceful Waimea Canyon, you’ve got to narrow your beach options down significantly. Hit Kauna‘oa Beach for pure, unadulterated sun bathing, or enjoy the scantily-clad surfers on Oahu’s North Shore. You won’t find many wetsuits here! If you’ve just got to try hula dancing in its natural habitat, sway your hips over to Lahaina Beach in Maui. Snorkellers will find some of the best dives in Kealakekua Bay on the Big Island, so grab some gear and prepare to hop—or more realistically, float—between islands. Many of the main islands have an airport, but Honolulu International Airport (HNL) offers easy access to top sights and accommodation in Hawaii. With numerous intercontinental flights each day, Honolulu is a great starting place no matter where you’re flying from. If you’d rather stick to one or two islands, booking one of lastminute.com.au’s awesome Hawaii car hire deals will give you freedom and scenic drives. To hop from island to island, catch a ferry and enjoy the views as you float by. The weather is always gorg, so booking holidays to Hawaii is a good choice year-round, though right now it’s peak season. The weather’s perfect for enjoying that famous island twang at a slack-key guitar festival—there’s practically one a month around here somewhere. You can also enjoy the more traditional sounds at the 39th Annual Prince Lot Hula Festival and the 46th Annual Ukulele Festival, both the weekend of 17 July. Yup, festivals and celebrations are a pretty big deal here, and have been for a long time. That might make the 22nd Annual Made in Hawaii Festival seem like just a baby, but if you want one place to pick up the sweetest local souvenirs, you’ll be at the Neal S. Blaisdell Center on 19-21 August, anyway. Because yes, you do need that rare orchid sent home to your flat, and your dad would love that hand-made straw hat. And how about some food, fun and music while rubbing elbows with thousands of your favourite Hawaiians? We never could say no to a party, especially the Aloha Festivals Waikiki Ho’olaulea block party. Where else can you dance around to island tunes with a plumeria crown and a pair of thongs? Makes us wanna drop everything and score some ridiculously good-looking deals on Hawaii accommodation with lastminute.com.au. What about you? Get your taste buds ready, because you’re in the birthplace of Pacific fusion cuisine, a yummy combo of traditional Hawaiian, Asian, and Portuguese food. Sample some poi (taro root paste), laulau (ti leaf-wrapped pork and butterfish) and haupia (coconuty, gelatiny dessert that also makes a great laxative…you know, in case you were wondering). You’ll be satisfied—and regular—in no time. Want to party like royalty? All you’ll need is a whole pig, a grass skirt, and a bed of hot coals. 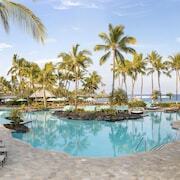 Or just book the Ali'i Luau Dinner Package for an award-winning, ready-to-go luau. You’ll get a visit to the Polynesian Cultural Center and take a canoe ride in the lagoon. Then it’s time to try some of the best food in Hawaii at a royal banquet in your honour. Pro Tip: That means lots of mai tais. The island of Oahu is where you’ll find tons of action after dark, so when you want to turn up the heat, head to nightclubs in downtown Honolulu. 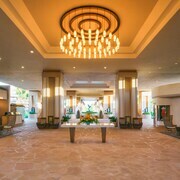 Otherwise, just hang out at a beach bonfire before tucking into one of the waterfront hotels in Hawaii. Hey, you gotta sleep sometime, right? Two words: shave ice. If you’re just popping in for a weekend or one day in Hawaii, choose Oahu Island – and try this sweet refreshing treat while strolling along Waikiki Beach in search of the perfect plot of sand for a quick sunbathe. There are plenty of flavours to choose from and you’ll need to cool down after hiking Diamond Head, Hawaii’s most famous volcano. Ready for more fame (though, perhaps not good fortune) in Hawaii? Much of the series Lost was filmed on Oahu. Run through the rainforest in hot pursuit of The Others on Kualoa Ranch. Or just munch on your trail mix stash, Hurley-style, at Police Beach, where the survivors’ camp was filmed. 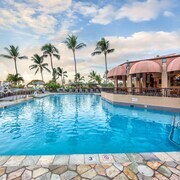 For short trips, Oahu’s one of the best places to stay in Hawaii because you’re close to it all. Check out a little World War II History by climbing aboard the USS Missouri, aka “The Mighty Mo”. Sounds like something an old uni buddy might call himself, huh? Wonder if he ever got lei-ed? 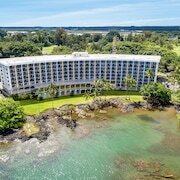 Speaking of…lay your head down in cosy Hawaii hotels ranging from fancy-pants luxury to adventure-ready and simple. 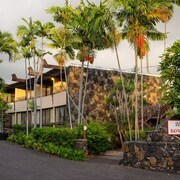 You’ll find heaps of accommodation on all of the eight main islands, from the northern villages of Kauai to the southern coast of the Big Island. 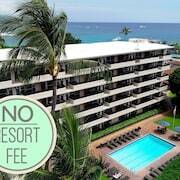 You really don’t have to choose and commitment is hard, so book Hawaii accommodation on multiple islands and catch the next wave to “The Aloha State”.